Of the two, Hiroshima is the most well-known and tends to get the most tourists, partly because it was “the first” and also because geographically it is much closer to Tokyo, Osaka and Kyoto and therefore more convenient to get to and this is a shame, because although Hiroshima is actually a rather more attractive place than you might imagine given it is basically an industrial centre (this is where Mazdas are made) there is little there for visitors to see other than the “sights” related to the bombing. 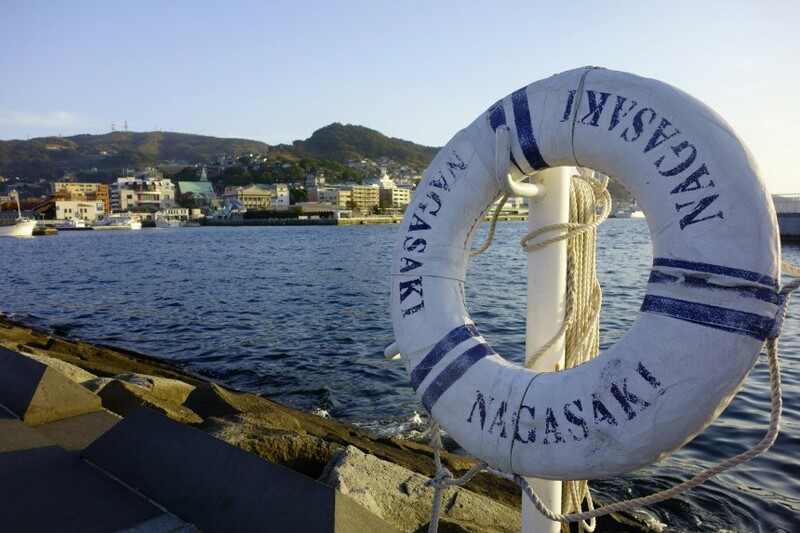 Nagasaki on the other hand can claim a much longer and more interesting history. 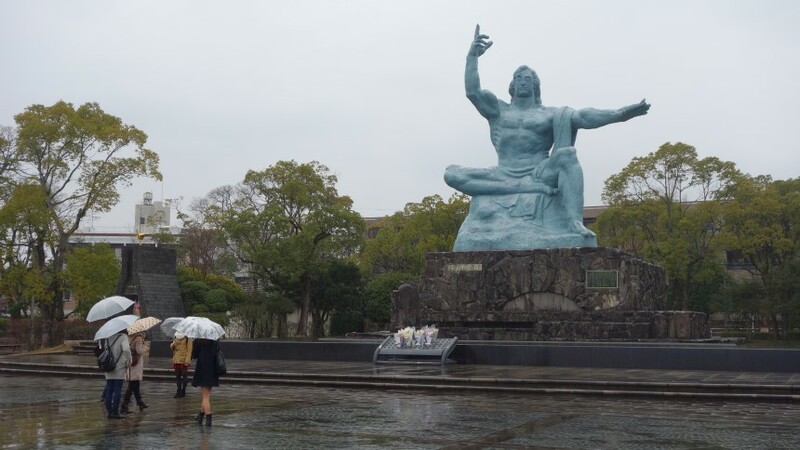 Through several centuries of Japan’s self-imposed isolation, Nagasaki remained its only window to the world, with trade with first the Portuguese and later the Dutch being maintained here for over two centuries. The topography of Nagasaki, with its several hills and valleys also spared some of the older parts of town from destruction when “Fat Man” was dropped by Bockscar 6 days after the bombing of Hiroshima. On top of that I was also lucky enough to visit during a later festival meaning that in many places it looked like the kind of Japan your imagination might paint. 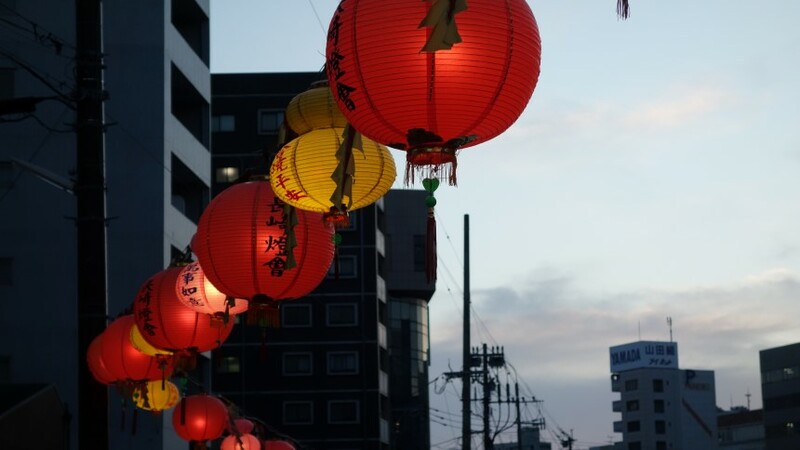 Lantern festival was a bonus! 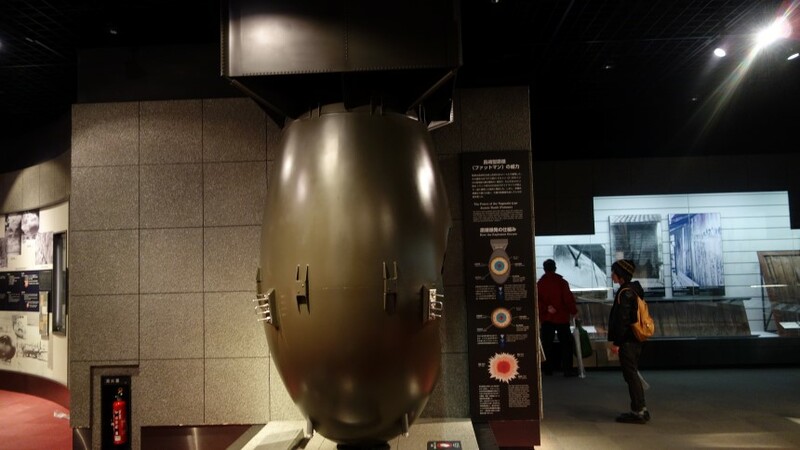 So Nagasaki is certainly worth a visit in its own right, but regardless of its other merits, it would be foolish to think that anyone visiting either place is going to overlook its atomic past, so here are my views on the two respective museums and peace parks. 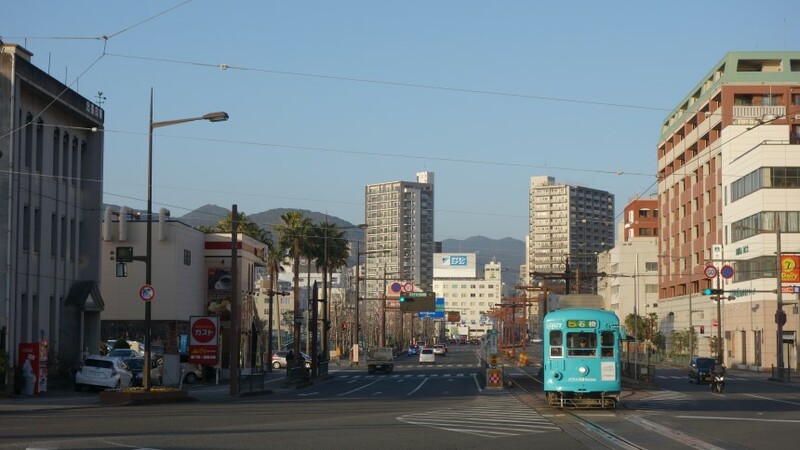 First, Hiroshima, which had the benefit of being lit by a beautifully blue sky when I visited. 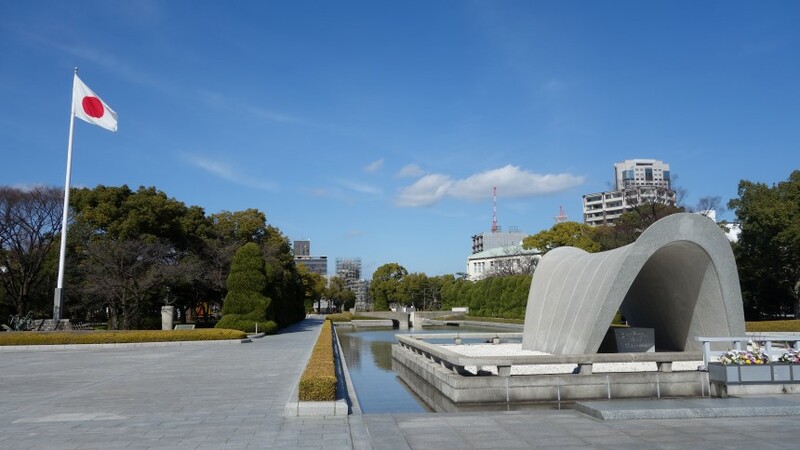 The park is set on an island that used to be the fashionable heart of old Hiroshima and contains several sculptures and memorials to the dead. It’s a pleasant, quiet place to stroll through, especially in beautiful weather, although locating all the different memorials can be quite difficult as various paths and trees can make them hard to spot. Also just across from the park is the “atomic dome” the remains of a Czech designed building from 1913 that have remained as a memorial to the destruction. Although during my visit it was covered with scaffolding for repairs. 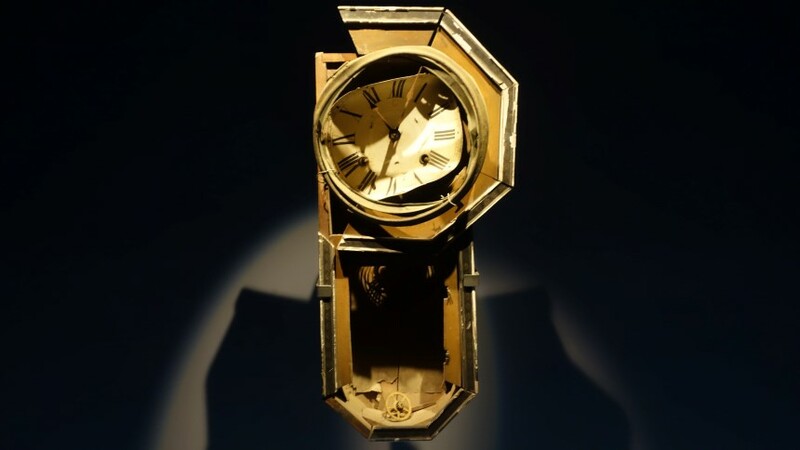 Whether the term repairs or even restoration is appropriate when you are trying to keep something in its damaged state is perhaps a question for a different time. 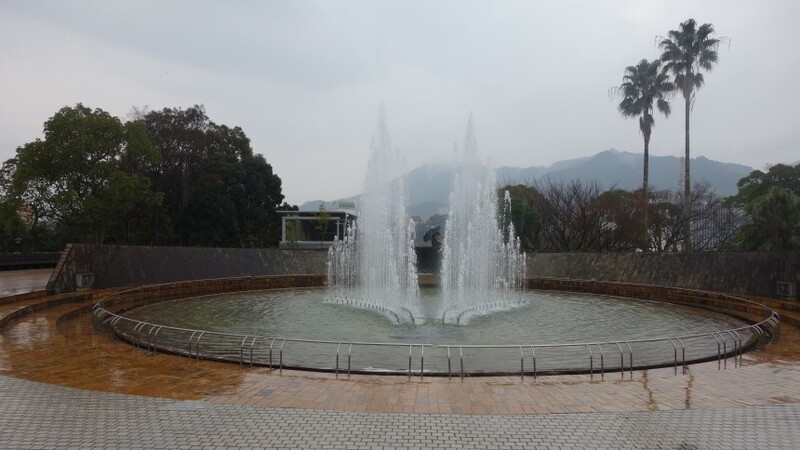 In comparison, Nagasaki’s memorial park is much smaller and separated into two different places. There is a huge memorial peace statue at the top of a hill, the artistic merit of which I won’t comment on, but dodgy sculpture aside, it is again a moving place, perhaps helped in this instance by the persistent rain, which gave those visiting the site, umbrellas aloft, the air of mourners out of one of those Hollywood funerals that always seemed to take place as storm clouds gather overhead. Perhaps again because of the weather, or maybe because as I mentioned earlier it is further away from the main tourist trail, it seemed quieter and I spotted no other non-Japanese visitors there. As for the museums, they are in content, fairly similar. 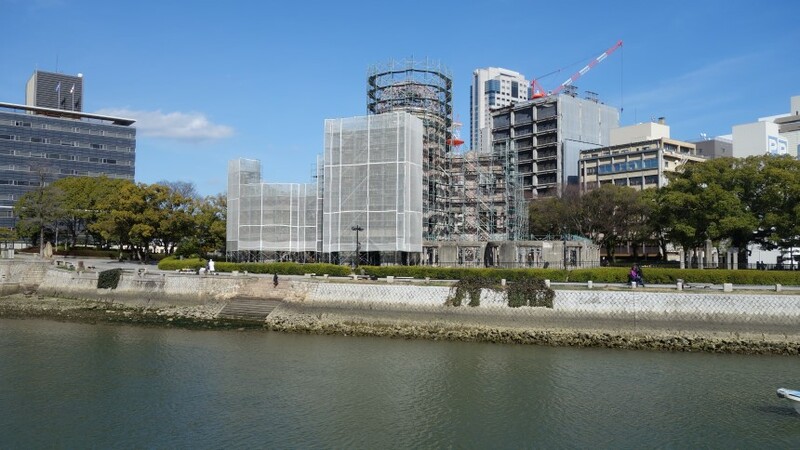 The museum at Nagasaki is newer and slightly larger, but the one at Hiroshima is currently undergoing work to expand its exhibits that will that imagine will lead it to become very similar. They are both moving places. The stories of individual survivors, and the artefacts of victims or survivors cannot really fail to be so. In fact they are deliberately set out to be so in a way that I would argue is actually rather emotionally manipulative. I would estimate that 80% of the clothes and personal effects on display in the Hiroshima museum are from children. Highlighting perhaps how innocent lives are lost in bombings but then this is not necessarily unique to Hiroshima or Nagasaki or reflective of the make up of the victims. Of course the after effects are, and there are accounts and stories of those who suffered illnesses and death later in life due to the results of the bombing and the various illnesses that can result from radiation exposure. Which brings me on to my biggest issue with both museums. There is in my view an alarming lack of context to why the bombings took place. 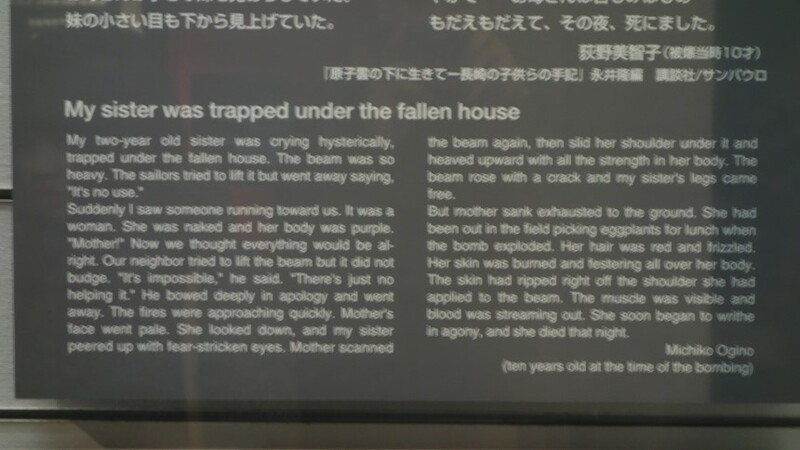 Whilst the museum at Nagasaki does give an overview of the development process for the nuclear bomb by the Americans, it does this in such a way as to argue that a major reason for the Americans dropping the bomb was simply to justify the amount of money they had spent on making it. This is a valid argument but when dealing with what is obviously a sensitive subject, I would have hoped the museum would be able to show opposing arguments which are equally if not more convincing. It also displays a transcript of a letter written before the bombing by various leading scientists that using the bomb without giving Japan prior warning would be morally wrong. Now this is a view I could probably agree with, but whether this would have made any difference to Japan’s actions is perhaps questionable and not mentioned. After all, Nagasaki was bombed after Hiroshima and you could argue that Hiroshima was somewhat of a prior warning that the US now had a very powerful bomb indeed, but Japan still did not surrender. 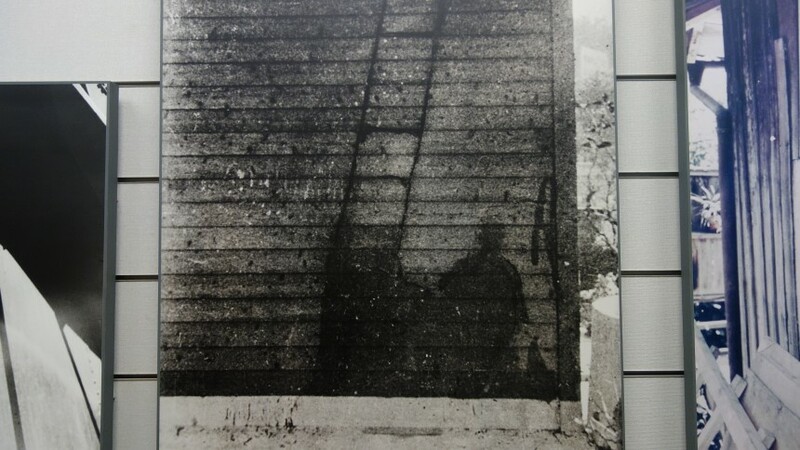 Another panel at the Nagasaki museum points to a report made by the US after the war that suggested that in all likelihood the war would have ended in October/November of 1945 regardless of the use of atomic weapons. Again, perhaps true, but it is also only one half of the story. In those extra two months, how many more Allied soldiers would have lost there lives? And how many Japanese civilians and troops would have died from further conventional bombing raids which had been devastating other Japanese cities prior to the atom bombings? In addition the evidence from the Okinawa Islands where Japan effectively fought a gruesome battle to the death rather than surrender in the face of an unwinable situation doubtlessly influenced the Allies at the time that Japans surrender wasn’t exactly imminent, however obvious their defeat appeared to be. And Basil Fawlty would probably be rather happy with both museums because they both seem to have been taken with his mantra of “don’t mention the war.” In both there is very limited coverage of the POW’s and foreign workers who died in the bombings or why they were there in the first place. 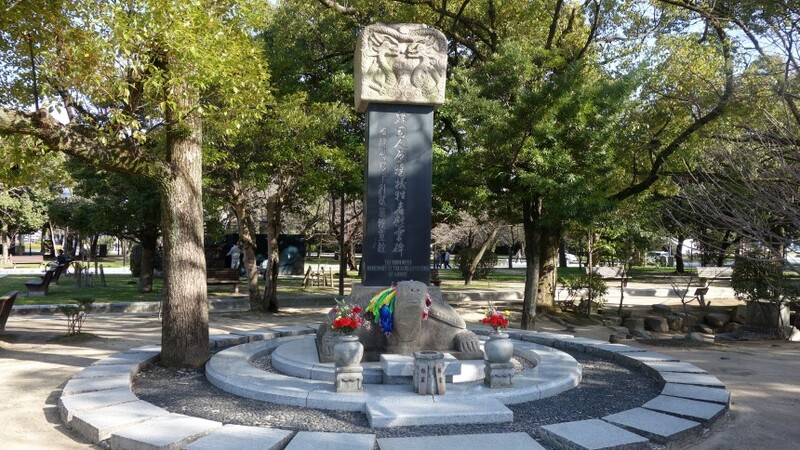 In particular, in Hiroshima it is estimated that up to 20% of the dead were forced labourers brought over from Korea, yet they receive very little coverage in the museum and the memorial to them in the peace park, a relatively recent addition, seems rather tucked away at the side. The Nagasaki museum did appear to show an overview of the war , but it was only available in Japanese and very brief. In short, neither museum is really a museum covering the bombings in the context in which they took place. They are in fact entirely different museums. They are museums purely aimed at showing just how devastating a future nuclear conflict could be. They are museums of a war that as yet, has never happened (and hope to god it never does!) and promotional tools for its prevention by citizen action, with both museums having an “exit by the giftshop nuclear disarmament petition”. These are noble ideals in themselves, but will leave a significant, if not fatal gap in visitors understanding of the stories most visitors expect them to tell. Shame the dome was covered in scaffolding! Interesting read Dan. Having done various ‘Vietnam’ war places when there it is always noticeable that the bigger picture is somehow lost/not mentioned. Let us hope that Nagasaki/Hiroshima are the only two uses of nuclear weapons in anger/war.